Mainly from switches 34%; routers 16%; services (I am assuming SmartNet) 19%; and 24% Advanced tech (VoIP, Security, Wireless, Consumer). 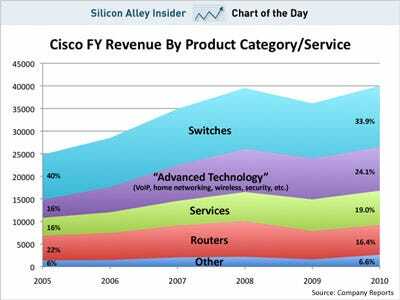 I wonder where Linksys, Flip and Atlantic Scientific fit into that chart. Anyway, according to GigaOm, "Last week also brought evidence that slower consumer spending is also starting to take a toll on tech. ... It’s true that the mobile web and cloud computing are young markets with a lot of growth ahead. But many of the companies using the services or buying ads to support revenue are returning to a cautious mindset as they see uncertainty ahead." "That caution is a reminder of what Sequoia partner Eric Upin said in the RIP Good Times presentation nearly two years ago: We could be entering a 15-year secular bear market. If so, we’re only looking at year three. It doesn’t mean the growth will necessarily slow dramatically across the board, but it does suggest smart managers should be planning to react if growth slows considerably."